Sorrento Villas is a family-friendly 21-room apartment-style hotel minutes from the beach. Each studio and villa is air-conditioned and features tile floors, a flat-screen cable TV and free Wi-Fi. Each has a full kitchen with a refrigerator and microwave. Coffee makers are provided and hair dryers are available on request. Private bathrooms are shower-only. Housekeeping is offered once per stay. Sorrento Villas has a sundeck and a picnic area with barbeque grills. The front desk is open limited hours. There are self-service laundry facilities on-site and there is limited free on-site parking. There is no restaurant on-site but there are many dining options nearby, including several Cuban restaurants, some with entertainment, a deli, cafes and bars. 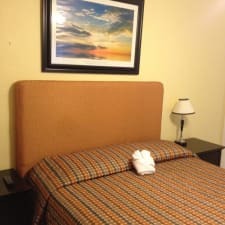 The hotel is a 5-minute walk from North Beach, a 26-minute walk to Surfside Beach and 6 miles from the Art Deco Historic District in South Beach. Miami International Airport is 14 miles away. Guests love the large apartments, especially families. Full kitchens with refrigerators and microwaves and dining areas make it easy to prepare and serve food, whether it's a full dinner or quick breakfast before heading to the beach. The units are also popular for extended stays. Guests rave about the owners and staff here saying they are friendly and helpful and make guests feel welcome. Some say the apartment atmosphere and caring staff make staying here feel like being with family. Guests say they even provide beach towels and umbrellas. Miami is known for its food and this is a great area for dining out. There are some very good restaurants and bakeries nearby. From fine dining to ethnic fare and café-style eateries there is something for just about any appetite. Some units are located on Harding Avenue, which can be fairly busy and loud. Guests say traffic goes by all night long and can be disrupting if you're a light sleeper. Quieter units are available that don't face the street. On-site parking is free but it's limited and guests say finding a parking space in the neighborhood can be challenging. A quick trip around the block usually turns up a free space and most guests say they can usually find a space fairly close by. Hard CouchesGuests complain about hard couches in the apartments and say they are uncomfortable, especially if used for sleeping.